100% preshrunk heavyweight cotton, 6.1 oz., seamless collar, taped neck and shoulders, double-needle throughout. 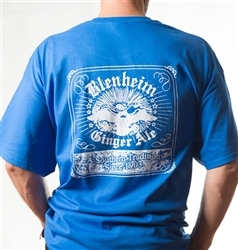 Small Blenheim Ginger Ale Logo on front left. Large Blenheim Ginger Ale Logo on back.